By default, Pipefy takes care of the delivery of all emails sent through the platform. 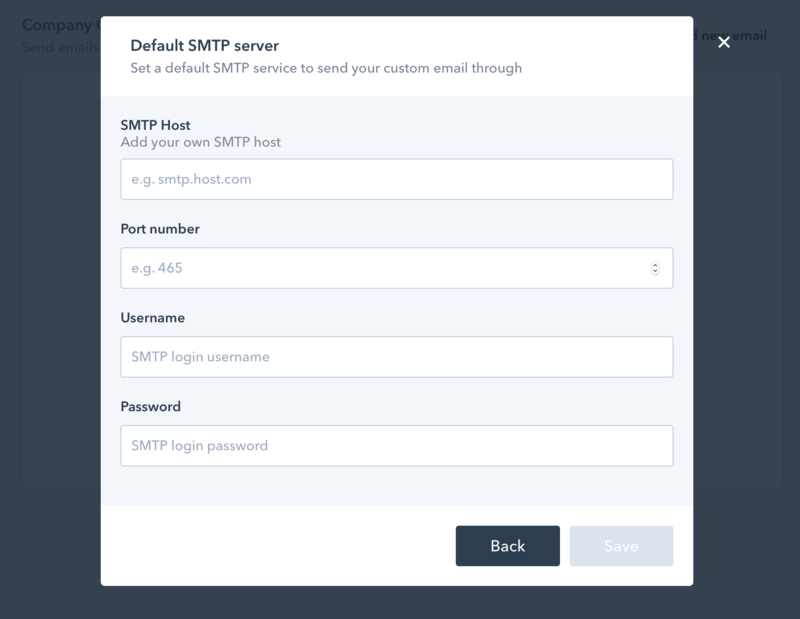 However, we now allow customers in the Enterprise plan to send emails through any other SMTP mail server (if your current plan is not the Enterprise and you're interested in upgrading to use this feature, please contact our support team via the in app chat or write to support@pipefy.com). By allowing our customers to use their own mail provider, they can use an email address on their own domain to get better opening rates and fully manage, monitor and troubleshoot email delivery. Our customers will be able to add multiple email addresses to their company, each with its own SMTP settings. We'll enable emails sent through the Email Templates and Email Messaging features to be submitted using the custom SMTP server that matches the "From" address. 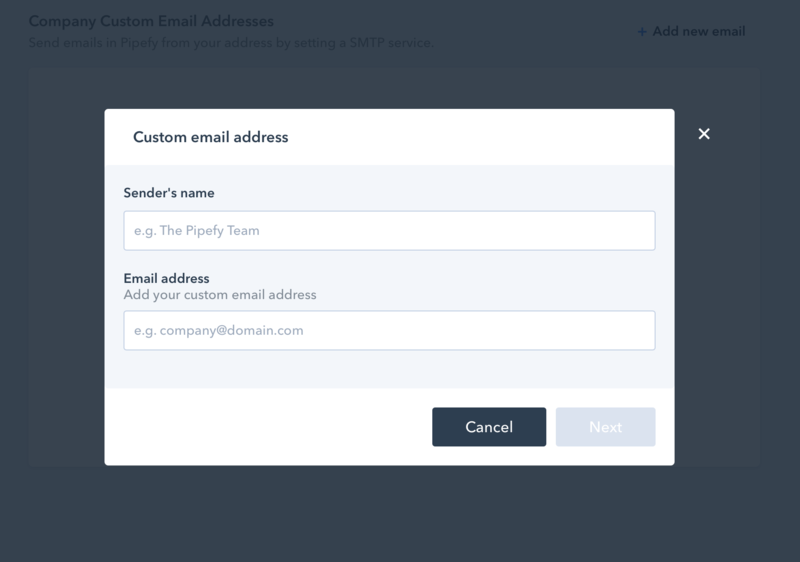 NOTE: Pipefy is not able to receive emails through your custom email address yet. 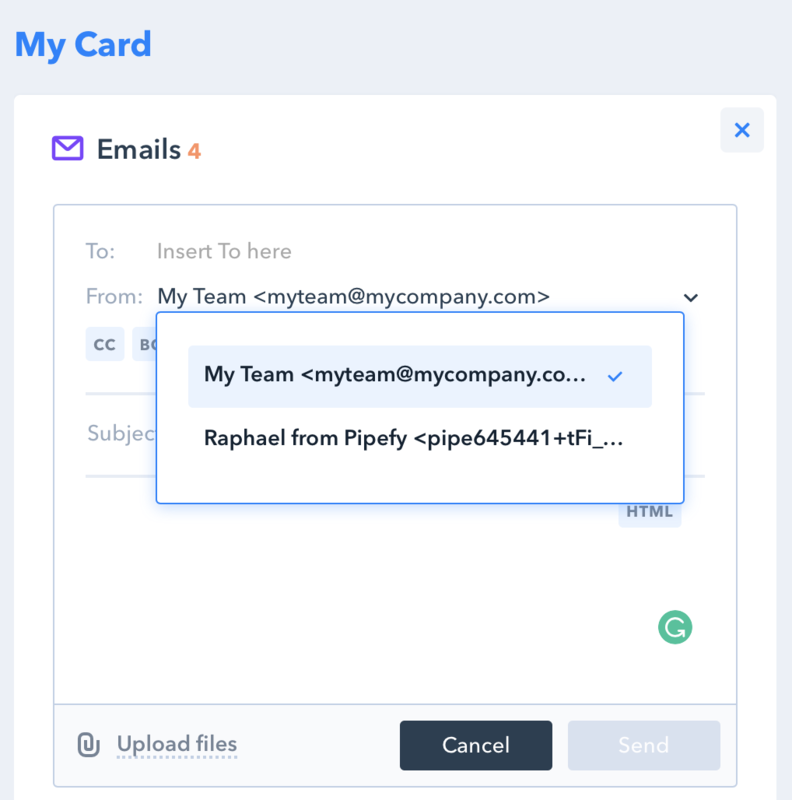 Any emails sent through the email messaging feature will be sent via a Pipefy email address in the "Reply to", so we can collect the response and add it to the card. After you set up your custom email addresses and SMTP servers, you'll be able to change the "From" in the email addresses to your custom address. Any replies will still be sent to the Pipefy card address, ensuring that the recipient recognizes your email while at the same time enabling Pipefy to collect the responses and add them to the card. To allow Pipefy to send emails from your email address, we need to know which emails you want to set up and which are the SMTP server details for each one. Only company admins can access the company settings to enable custom emails addresses. 1. Open your company settings by clicking on your profile picture in the upper right corner of the screen, then on 'company settings'. 2. Click on the "Email settings" tab and then on "Custom Email Address". 3. Click on the "Add new email" button to add a new custom email address and start setting it up. Email: Determine which email address(es) will be used to send the emails and will be displayed as the sender in the "From". 5. After setting up the email address we will need your SMTP server details. If this is the first email that you're adding, we'll assume this as your default SMTP server for the company. If needed, later on you can specify a new SMTP server for each email address. 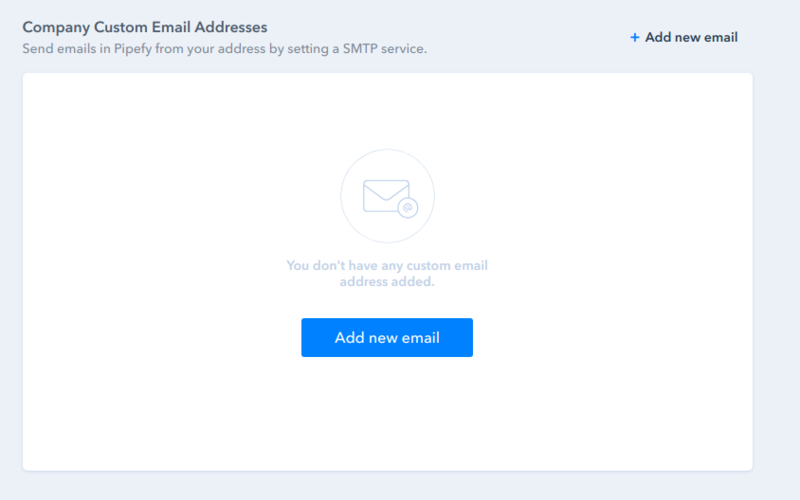 To make sure that emails can be sent from Pipefy to your SMTP server, you must open the right ports and allow inbound connections from our IP addresses. Please ask our support team via the in app chat or writing to support@pipefy.com to get the list of our IPs to allow connections to your server. It must support LOGIN authentication. It must support TLS 1.0 or higher. 6. Now that you have configured the email address and SMTP server, you can use this email inside the Email messaging, and Email templates feature, by changing the "From" field in both places.